elady01 has no other items for sale. *$56 for 24 months. Minimum purchase required. Ferrari by Cartier Men's Vintage Day Window/Rotating Bezel Designer Watch-Rare! 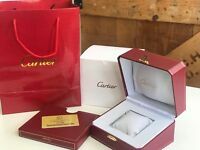 Cartier Watch Box With Pillow&Booklet.